In The Kingmaker's Daughter, number-one New York Times best-selling author Philippa Gregory presents the riveting story of Anne Neville, her sister Isabel, and their ever-changing fortunes. The Kingmaker's Daughter is the gripping and ultimately tragic story of the daughters of the man known as the "Kingmaker", the most powerful magnate in England through the Cousins' Wars. In the absence of a son and heir, he uses the two girls as pawns in his political games, but they grow up to be influential players in their own right. In this novel, her first sister story since The Other Boleyn Girl, Gregory explores the lives of two fascinating young women. At the court of Edward IV and his beautiful queen, Elizabeth Woodville, Anne grows from a delightful child brought up in intimacy and friendship with the family of Richard, Duke of Gloucester, to become ever more fearful and desperate when her father makes war on his former friends. Her will is tested when she is left widowed and fatherless, with her mother in sanctuary and her sister married to the enemy. Fortune's wheel turns again when Richard rescues Anne from her sister's house, with danger still following Anne, even as she eventually ascends to the throne as queen. Having lost those closest to her, she must protect herself and her precious only child, Prince Edward, from a court full of royal rivals. I really enjoyed the first book in this series, The White Queen. I've read many of Philippa Gregory's book and they're always top notch. Likewise I enjoyed # 2, The Red Queen. By the time # 3 (The Lady of the Rivers) rolled around I was starting to worry a little about how things were going. I applaud the idea of taking the same basic story and telling (and retelling) it from different perspectives, but by the time I got to # 4 (The Kingmaker's Daughter) the idea was feeling overplayed. There was a lot of repetition in this book (the main character obsessing over the same thoughts and making the same points over and over) and I think this, coupled with the fact that the reader pretty much knows the story inside and out by this point, made for dry reading from time to time. Once you get passed the first 3 books the only thing new is the main character's inner thoughts and perspective so there's nothing really that makes this a compelling page turner. Nobody new joins the story, there are no big revelations, you know who is going to die and at what point in the timeline, etc. It's nice to know what Ann's thoughts were on everything, but that's just it, nice. I don't feel like it paid off in comparison to the time and money investment of buying and listening to the book. Having read the reviews for Book # 5 I don't think I'm going invest another 15 hours in this story, and I don't think I'll lose any sleep over it. Another great book by philippa gregory! What made the experience of listening to The Kingmaker's Daughter the most enjoyable? What was one of the most memorable moments of The Kingmaker's Daughter? When anne went to court at the christmas festives. I think it was one of the happiest times of her life. Bianca Amato did an excellent job in giving each character distinct accents and different voice tones. Her performance was impeccable. I really enjoyed listening to her. If you could rename The Kingmaker's Daughter, what would you call it? Lady of the River's may still be my favorite book of this series this one is a close second. Ms. Gregory does an amazing job of weaving together I single story with multiple points of view. Even though it is the pretty much the same story as the first 3 books, the reader gets a whole new point of view and a whole new Hero to love and Villain to hate. THIS IS A MUST READ!!!! But listen to the other books in the series first it will help with understanding. Would you listen to The Kingmaker's Daughter again? Why? The thing about Philippa Gregory’s books is you can always read them again! I find my self cross referencing her other books in this series. It’s amazing how you read one of the books in the series, and you are completely behind the main character. Then you read another and you change your mind completely. I think now that I have read all three, I need to read them again to decide which character is really my favorite. My favorite scene was when Anne and Isabelle made up after fighting for so long. I think it was a perfect scene to show how sisters can have so much hate and envy towards each other, but sisterly love is forever. However, the most intense scene was when Isabelle went into labor on the ship. It was so intense and powerful. The scene set the tone for the events that followed. The Kingmaker's Daughter is a repeat of the exact same story as Phillipa Gregory's The White Queen except told from the perspective Anne Neville. If you have read the White Queen don't buy this book unless you have credits to spare and want to read the same story again. It wasnt that I didn't enjoy listening to the book, per se, but it was waste of a credit. I am going to be returning the book. I agree with other reviewer's that this is grade B historical fiction and formulaic. It was an easy way for Phillipa Gregory to publish another book to make more money but doesn't add anything additional to the Cousin's War Series. Ffinally gave up, it was too dragged out both in the writing and the delivery. There are many great parts of this story. This is basically the Richard III story but told about the women instead of the men. It had great possibilities. What didn’t you like about Bianca Amato’s performance? Do you think The Kingmaker's Daughter needs a follow-up book? Why or why not? All these women who part of the story of the Tudor rise to the throne are so interesting. But so far I have been disappointed in the books. The reading makes the characters seem so weak and whiny. The story is told from the perspective of the daughter. She makes assumptions without knowing all the facts which gives her impressions of those around her. Her eyes are then opened as the story unfolds and she learns the truth. So many emotions in this story makes this book quite a roller coaster of feelings to read/listen to. Rarely was there a dull moment. What did you like best about The Kingmaker's Daughter? What did you like least? I love the history but this one went on way too long. I understand shaping and building characters but it got to the point I did not care what Ann had to say. 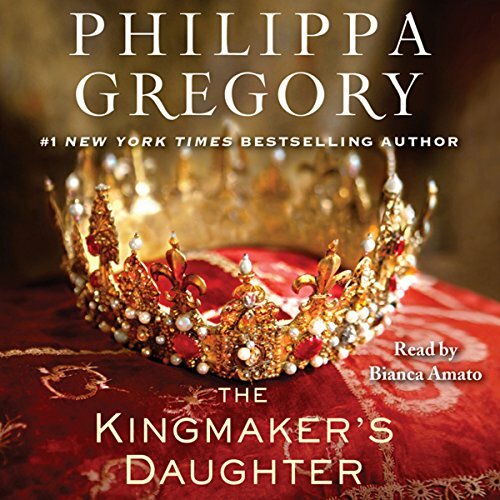 If you’ve listened to books by Philippa Gregory before, how does this one compare? I enjoyed the other books I listened to but this one dragged. What three words best describe Bianca Amato’s performance? Women voices were Ok but the men left a little to be desired. If you could sum up The Kingmaker's Daughter in three words, what would they be? There were no particularly memorable moments in this book for me though it was a solid read. I found the continual mourning of the main characters almost tiresome, though this book is no doubt at least partially based on true fact. I enjoy Ms. Gregory's books and will continue to "listen" to them! Bring on the White Princess. This book was written from Anne Neville's point of view. It was refreshing to get an inside view of the court and the inner relationships of Anne with Queen Elizabeth, Queen Mary D'Anjou, Richard and her sister Isabelle. You could feel her emotion and struggles with these relationships. This is my first Audio book! Who was the most memorable character of The Kingmaker's Daughter and why? Queen Mary D'Anjou and now I have added the Red Queen to my Wish List. I really like historical fiction and Phillipa Gregory has been one of my favorite authors! This is by far one of her best books. It is told from the viewpoint of Anne Neville, the daughter of Earl of Warwick. She is a young girl at the beginning but is already enveloped in an adult world as part of the the Royal Court. It personalizes her struggles with her mother, Queen Margaret D'Anjou and Queen Elizabeth. Her relationship with her sister Isabelle is one of comfort and closeness and also one of pain and resentment. As the book progresses, you can see how Anne matures and becomes a strong women and fulfills her father's dream of seeing one of his daughters sit on the throne of England. well written historical novel. It's the first Audio book I've listened to read by Bianca Amato she has an interesting, eloquent voice- enthrawling!